Don't Dump On Deptford's Heart are joining forces with the No to Silvertown Tunnel campaign in January to monitor the local air quality. 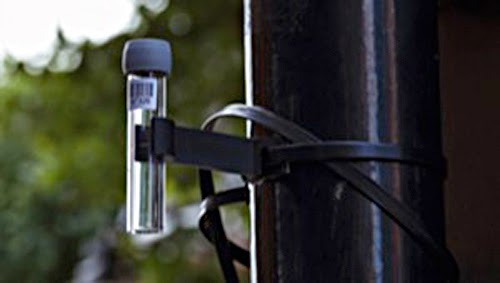 This "citizen science" testing is scheduled to co-incide with official London-wide air quality monitoring at this time. The local campaign against the Thames Tunnel shaft at Crossfields Green are looking for volunteers to help install the Air Quality Testing tubes on Sunday 5th January 2014 – and help collect them on Sunday 9th February. 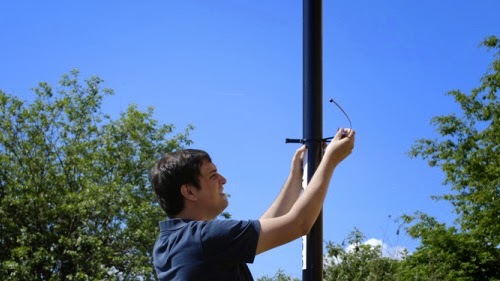 Volunteers, in teams of two, will need to go round the area with a stepladder to attach the test tubes to lamp posts, and carefully record the time and date and photograph where they have been placed. Each kit (which includes a tube, bracket and cable ties) costs £7. This also covers the cost of the lab analysis. Since the campaign has no funds, it needs help from locals. If you are able to spare some cash to help pay for one or more of the tubes, please pledge it by emailing ddodeptfordh@gmail.com. The more cash pledged, the more tubes can be installed. The campaign would like to place at least 30 tubes besides the roads that will be heavily affected by the Thames Tunnel construction traffic and the three year road closure of two lanes on Deptford Church Street. Since our air quality will be further affected by construction work at Faircharm on Creekside and potentially at Convoys Wharf off Evelyn Street, tubes will be placed at various points on Deptford Church Street, Creekside, Creek Road, Evelyn Street and along the A2 from Blackheath Hill to New Cross (or at least at Deptford Broadway). 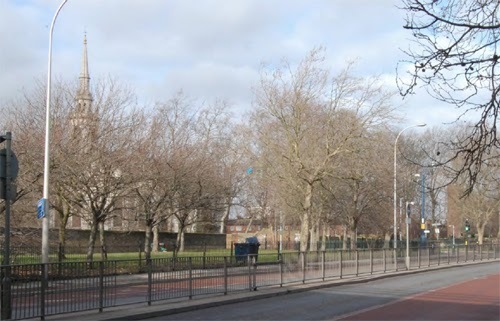 Lewisham's own monitoring is not particularly extensive in the immediate vicinity, but unpublished results from Greenwich Council's monitoring showed that the air quality at the Creek Road end of Deptford Church Street is already well above safety levels. Please help if you can! The tests will aid in establishing already existing high levels of pollution before proposed developments such as Faircharm, Thames Tunnel, Convoys Wharf and others begin. For Lewisham Council's response to the Thames Tunnel proposals at Crossfields Green, see here – go to the documents section to read their Local Impact Report 2013. 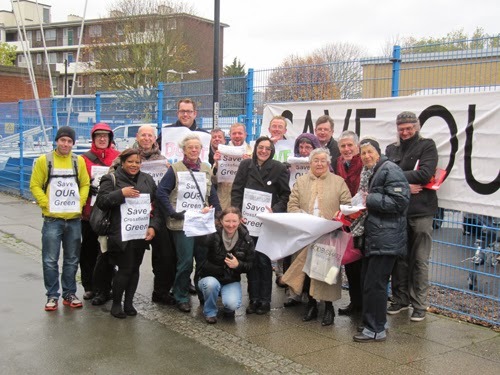 Hardy campaigners braved howling gales and freezing temperatures today to urge Planning Inspectors to ‘save our Green’ from Thames Water’s ‘super sewer’ plans for Crossfields’ Green, Deptford. More than 30 activists from Don’t Dump on Deptford’s Heart protested outside the second session of the Planning Inspectorate’s inquiry into the Thames Tideway Tunnel on Thursday 21 November, at the AHOY Centre, Deptford Green. And many took time to give evidence about the damage it will cause to the local community and fragile economy of the area. Local companies and their representatives explained how the tunnel work would blight business, and choke the recovery of Deptford’s High Street, already struggling due to the recession. And, Patricia Chantrey, Headteacher at St Joseph’s Roman Catholic Primary School, situated just a couple of metres from the Crossfields site, called for Thames Water to recognise her pupils’ need to play, exercise and learn outside rather than to be confined indoors. When quizzed by the Inspectors about alternatives for St Josephs’ children, she said there was no way of mitigating the impact, which would be particularly acute for those with breathing difficulties or special needs. Pointing out that air quality on Deptford Church Street is already significantly worse than recommended European Union levels, the campaigners argued that the controversial 46 metre shaft should be sunk in the Thames rather than one of the few green lungs for the neighbourhood. The alternative, proposed by Thames Water, is for spoil from the shaft and tunnelling work to be removed from site by up to 32 Heavy Goods Vehicles a day, forcing the closure of the whole of the western carriageway of Deptford Church Street. With several major construction projects already in prospect locally at the same time, HGV traffic is set to dramatically increase, raising road safety fears as well as concerns about noise and pollution. “Thames Water argues that because there is already noise and pollution in the area, we will not be troubled by more”, said Williams. “It is totally unacceptable, particularly when perfectly viable alternatives exist”. The Planning Inspectorate, which has the power to recommend to the Secretary of State whether the £4.2 billion project goes ahead or not, will publish their decision in late summer/early autumn 2014. Don't Dump on Deptford's Heart have produced a brief and very good document which contains the arguments against Thames Tunnel using the site at Crossfields Green. Download it here. Apart from the demo being organised (8.45am) for the start of tomorrow's Thames Tunnel Pubic Hearing at the Ahoy Centre (click to find location), we understand the public may attend the inquiry itself even if they have not registered formally to speak at this "Open Floor Hearing", which is being held by the government's Planning Inspectorate (not Thames Water). If you decide to attend (registration is 9 - 9.30am), you will find the document useful. Apart from the unacceptable rise in noise levels for the church, school and Crossfields residents, spoil from the shaft and tunnelling work will be removed from the site by hundreds of lorries, forcing the closure of the western carriageway of Deptford Church St, and reducing it to the two lanes closest to Crossfields. For three years. Work will also start next year on Creekside at Faircharm Trading Estate, and Creekside itself will become the main route for up to 90 construction lorries per day. When the Thames Tunnel work starts in 2016, Creekside will be used as a rat run, so there will be no letting up on our exposure to gridlocked traffic on all sides. In a recent survey by Greenwich campaigners "No to Silvertown Tunnel", it was revealed that Greenwich Council's own figures showed pollution levels at the top of Deptford Church Street where it meets Creek Road were on average 61.34 μg/m3 between Jan 05 and Jul 13. Readings above 40μg/m3 are in breach of EU air quality regulations. Update: (And how could we forget!) If Hutchison Whampoa's application for Convoys Wharf is approved by the Mayor of London (see our previous post and sign the petition there), they will start work in 2014 (to go on until 2023), adding hundreds of construction vehicles to Evelyn St and Creek Road, and causing massive congestion which will of course tail back along Deptford Church Street. 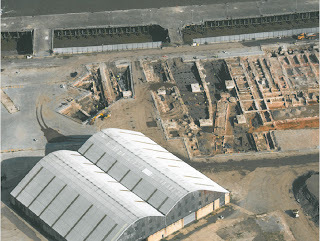 Thames Water's original site was at Borthwick Wharf on the riverside at Millennium Quay, where spoil could be removed by water. In a massive abandonment of their environment principles, they then switched the site to landlocked Deptford Church Street. We need to let them know we cannot tolerate the levels of pollution this scheme will bring, and insist they revert to their first chosen site. In addition, see this report that says the proposed increase in household waste water charges (by as much as £80 a year) may generate after-tax returns as high as 24% for Thames Water, more than three times the estimated 7% return for other water utilities. The Don't Dump on Deptford Heart's "They say, we say" document can be downloaded here. Convoys Wharf update – sign the petition! Last week the decision on planning permission for Convoys Wharf was taken out of Lewisham's control when the Mayor of London stepped in at the developer's request. Now that locals can no longer make their objections to the application, local campaigners Deptford Is have set up a petition to give a voice to the community so that we can let Boris know that we don't want this. PLEASE SIGN THIS PETITION AND SHARE THE LINK WITH FRIENDS. See Deptford Is... and local papers. Also read this week's Private Eye (click on the image below). Deptford's MP Joan Ruddock, in response to the Boris decision to "call in" the application, has described the site as "a heritage jewel in London's crown". The site is also of international significance, which is why the World Heritage Fund saw fit to include it on their Watch List for 2014-2016. Boris's glib soundbite to news reporters was that "London needs more housing". Don't be fooled by the notion that London's housing crisis can be solved by the building of 3000 more luxury flats. Originally, the percentage of "affordable housing" in new developments was set at 50% by Ken Livingstone. But most developers now claim that their sites are not "viable" (= massive profits) unless they deliver affordable housing at below 15%. In the Convoys application it is 14% – an extra 500 units at 80% market rent (still not affordable to the people who keep this city running), bringing the total to an impossibly dense 3,500 units. It is also feared that, like other major new housing developments, the units will be sold off-plan to foreign investors before going on the market in the UK. Overseas investors currently earn enough from the rise in property values they needn't even bother renting their units out to those who can afford the high rents. It's feared Boris will look favourably on this application, despite the GLA's own reservations to it in their report to Lewisham Planning (in particular from Transport For London). The developer is Chinese conglomerate Hutchison Whampoa, one of many holding companies owned by the 8th richest man in the world, Li Ka Shing. He also owns major utilities in water and power (ie, UK Power Assets who run much of the National Grid and London's power), fracking (via Husky, causing community uproar in Canada) and telecoms (3G and others – and they're currently being 'investigated' by the EU on their recent purchases of telecoms in Ireland and Italy), as well as major British container ports (see June 2013 post). 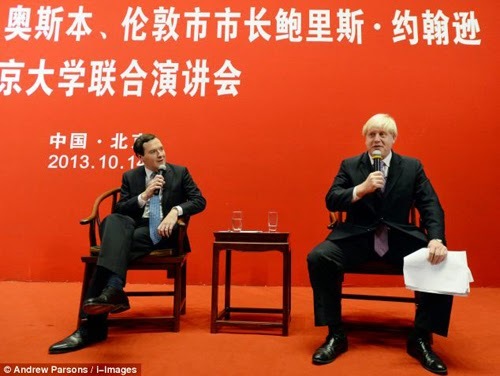 Boris Johnson has recently been courting Chinese trade. 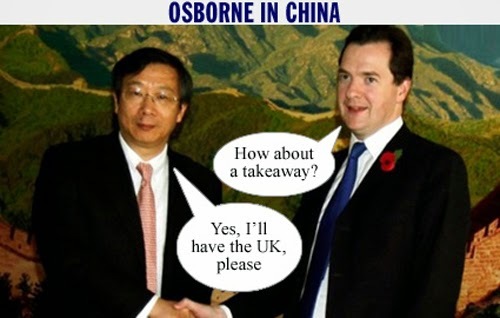 David Cameron is due to visit China next month "on a trade mission" and Li Ka Shing has been spotted in and out of No.10. Boris is also mates with Rupert Murdoch. (Thanks, Transpontine). Having sold the site to Hutchison Whampoa, News International has a profit share in the sale of the 3000 luxury flats planned for the site. And this week the PM launched the Regeneration Investment Organisation Advisory Board (RIO), "an inward investment body" with the aim of raising billions of pounds from overseas trading partners to "fund urban regeneration projects". Sky News reports, "Its remit has been borne out of a frustration expressed by many major overseas investors about the bureaucracy and complexity of finalising major deals in the UK". Like Hutchison Whampoa, for instance, who accused Lewisham Planning of making "unrealistic demands" and "unreasonable and unwarranted requests" that would damage their profit margins. The application proposes to build over almost every inch of the historic site, which was founded in 1513 by Henry VIII as the home of shipbuilding for the Royal Navy (the Royal Dockyard that, along with Woolwich dockyard, preceded the grandeur at Greenwich). To get an idea of the density, have a look round the development at New Capital Quay. That's 1000 flats with a ground space a third of the Convoys site. Imagine that x3. 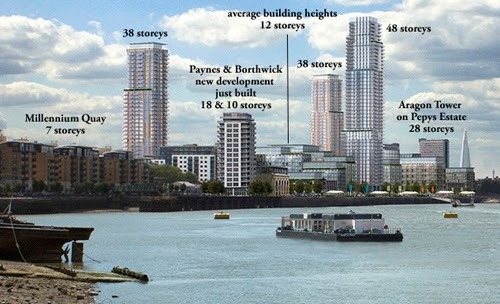 To get an idea of heights, look at the tallest tower at the new Renaissance development in Loampit Vale – that's 24 storeys, half the height of the 48 storey tower proposed at Convoys (the other two being 38). Convoys also contains the remains of Sayes Court Garden, where John Evelyn's innovative horticultural theories were developed and which led to the founding of the National Trust. It was his theory that trees are the lungs of a city. Considering the latest reports by the No To Silvertown Tunnel campaign, in which it was revealed that pollution levels at the end of Deptford Church Street on Creek Road have been breaching European limits for nitrogen dioxide for more than eight years, his advice is worth remembering more than ever. (Thanks, Deptford Dame). Especially since Hutchison's plans include parking provision for 2000 cars (all housed in the giant blocks of housing units) that will cause ever greater pollution and congestion on Evelyn Street. The only public transport will be a diversion of the 199 bus and a Thames clipper, putting greater strain on existing services. And don't forget the ten years of construction traffic. In an ideal world, the entire Convoys site should be planted with trees just to make up for the new IKEA being planned to go on the site the award-winning Sainsbury's eco-building at Greenwich peninsula, which will draw in traffic from miles around to unprecedented levels. (Thanks, 853 blog). But Hutchisons were arguing over the necessity of widening New King Street to accommodate the bus making a two-way journey. The history of this site is amazing – it features loads of important historical figures (Drake, Raleigh etc), was the launch pad for some fantastic scientific discoveries (Cook, among others), and was built and designed by many celebrated pioneers in engineering and shipbuilding (Rennie, Penn etc), as well as being a place where ordinary people who worked in and around the dockyard have fantastic stories to tell (female shipwrights, black and Asian sailors), that were never recorded by Samuel Pepys who ran the yard for Charles II. So much of Deptford's history has been buried and ignored (perhaps because of the shame of slavery), it is bursting to come through and speak to us. The site is monumentally multi-cultural – with links all over the world – as much as Deptford is now. Many of the site's surviving below-ground structures (docks) will be buried under dense 12 storey blocks and 38-48 storey towers. The one remaining above ground structure, the Olympia Shed, will be overshadowed and hidden from view by the buildings closely surrounding it. You'll only be able to glimpse a small part of it from the river. Hutchisons were rejecting English Heritage's demands to open the view up. 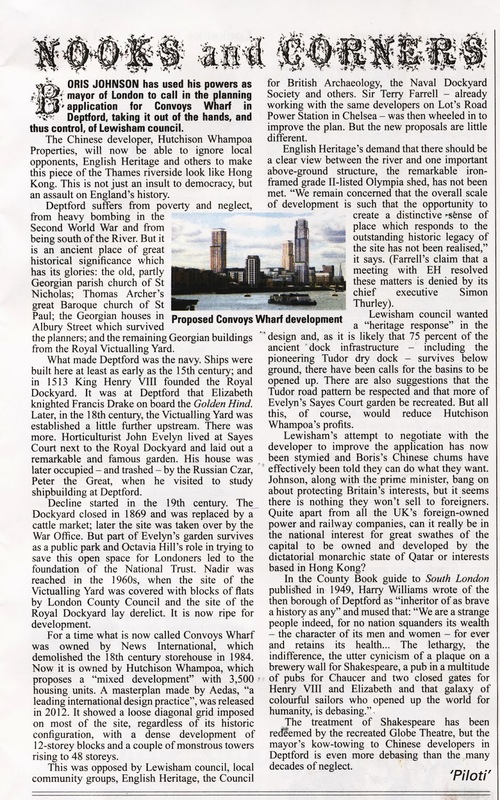 The plans have been opposed by English Heritage, the Council for British Archaeology, the Naval Dockyard Society and other heritage bodies – not forgetting, of course, the local people who will have to live with ten years or more of building works and construction traffic. 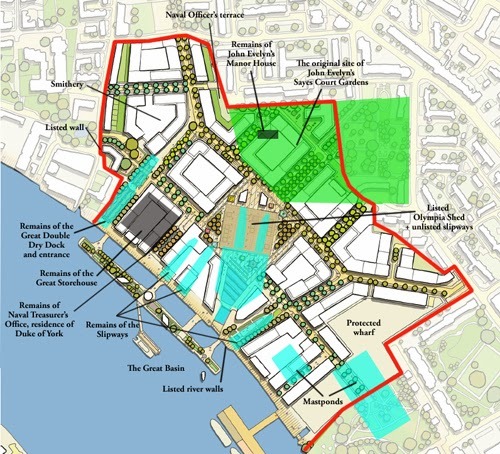 The public space provision in the present application is laughable – a thin strip on the riverside and two strips on the sites of an historic dock and slipway, which are only not being built on because they're "protected". They could actually be listed by English Heritage, but not until the full archaeology report made by a commercial arm of the Museum of London which (had to be) commissioned by the developer has been published. It hasn't been published yet, despite the archaeology work being long completed – although not as thoroughly as it could have been (there is, according to Deptford Is, areas of the site yet to be uncovered). English Heritage have recently listed the remaining walls on the site (including the river walls), which must make it the longest length of listed Thames wall in London. Meanwhile, with no full report, the archaeology of the site is not "fully understood". It would therefore be premature for the Mayor of London to make a decision until this report is published. Local campaigners have emphasised the heritage of the site and how it can open up a tourism strategy for Lewisham, bringing in visitors from Royal Maritime Greenwich. Unfortunately, the owner of the site is so fixated on the simple formula of selling luxury waterfront residential units that it cannot envision the advantages of owning a site of world heritage – and the capital value that would add to a smaller number of units. Deptford Is are also advocating that an area on the site designated by the Greater London Authority (GLA) as a "protected wharf" (to be used for river business, very often simply cargo) should be developed as a Maritime Enterprise Zone incorporating boat building and repairs and other associated marine business that is presently lacking in this part of the Thames and which would bring great employment opportunities. But this is strongly opposed by the developer, who will more than likely lobby the GLA, with Cameron, Osbourne and Johnson's help, to change the designation so that it can build even more luxury flats. If you care about Deptford, you must sign the petition! This application must be opposed so that a better proposal can come forward – one that combines housing with a full appreciation of the site's heritage. 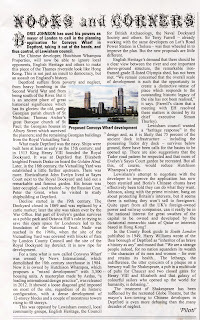 Update 18 Nov: also see the Deptford Dame's take on the Mayor of London's new role in the process. The Planning Inspectorate hearings are almost upon us! They will be hearing evidence on the Deptford elements at two separate sessions on Wednesday 13 November in the City, and on Thursday 21 November in Deptford. A couple of members of the campaign will be attending the 13th to observe, but following a quick meeting of supporters on Saturday, we’ve resolved to focus on the hearing on 21 November with a demonstration of our opposition. 11am Saturday 16th November: Meet outside Wavelengths Leisure Centre, Giffin Street, Deptford to help distribute our leaflet and posters. 8.45am Thursday 21 November 2013: The AHOY Centre, Borthwick Street, Deptford. Even if you can’t get to the hearings, please spare an hour and help us get our voices heard. Plans to move the train cafe to Douglas Square have been taking a long time, and we heard it could be up to a year before it is relocated. In the meantime, the Deptford Project developers Cathedral plc had now agreed to help the cafe business owner's storage problem by moving it to one of their other sites in Greenwich (yet to be redeveloped) so that building work can commence on the Deptford site. But at the end of last week the train was squatted. 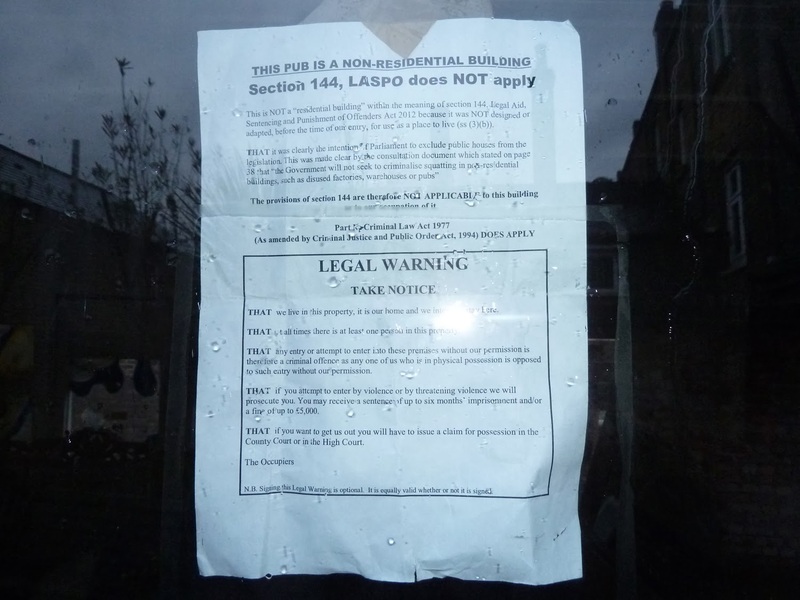 This is the same notice as was pinned to the door of the old Job Centre (perhaps even the very same notice), which was squatted at the end of September, just as refurbishment work was about to start on the new pub that is planned for the building. Although a train is not a pub, it seems the same rules apply, and no-one except the squatters can enter the premises. The decking was due to be removed and donated to a garden project, but now cannot be touched since it would deny the squatters access to their new pad. The electricity supply was also due to be cut off, but the squatters say it would be a breach of their human rights to remove their only source of power, which means the cafe (not the developer) may be stuck with a large bill. No one was in when the site security guard let us into the yard on Saturday to take these photos. The developer's schedule will now be held up until they can get a court possession order. Not that they have seemed to be in any hurry to get started since they got planning permission several months ago. Meanwhile, another local cafe is about to close, also thanks to redevelopment – the Creekside Cafe on Creekside, part of Faircharm Trading Estate. Their lease is up and there's no point in renewing it, since some time in 2014 building work will begin to turn a thriving employment zone into luxury housing. This will last three years or more and bring great disturbance to Crossfields residents. Unfortunately, a Lewisham Planning Committee agreed earlier this year that Workspace plc cannot make enough profit for its shareholders by simply providing actual workspace. Creekside Cafe's situation differs from the train cafe in that its owners (Mason's Catering, already a fairly successful catering firm based on Deptford Church Street) knew nothing about Workspace's plans to turn Faircharm Trading Estate into luxury flats and chuck out the businesses that the cafe serves when they took on the tenancy. 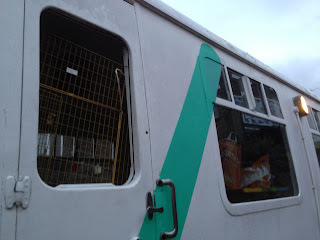 The train, on the other hand, was initially supported by the developer, who paid for its installation as "meantime use" on the site. In return, Cathedral ingratiated itself into the community with its branding, whilst boasting the cafe's successes as its own. Until, that is, they got their planning permission and wanted rid of it. The same clever developer did the same last year with the pop-up Mvemnt Café by Greenwich DLR, which was run by Greenwich Co-operative Development Agency, who knew the limits of the project – to cash in on the Olympic pedestrian traffic to Greenwich Park. Perhaps a fine example of "meantime use". Cathedral hailed it as a great success, though we hardly ever saw or met anyone there (since most Olympics punters were herded away from it and all the other Greenwich businesses). It seems "meantime use" can only work if the business can be easily relocated or closed down. But even then, a planning application can take a long time to come to fruition, and there are often delays in building phases once permission is got, so any business who takes up a "meantime" offer suffers enormous insecurity about when they must move out. In the meantime the business may have become established in the community, sorely missed as a community resource when it's gone, and the business itself left with debts it has no chance of recouping if it cannot easily relocate. And even if they can, like the businesses being chucked out of Faircharm, relationships in the community built up over many years are severed by a move to another borough or town. Meanwhile, Creekside Cafe has only been around for a relatively short time, but their cheap and tasty food proved popular with and highly convenient for local artists, craftspeople and residents – and those Creekside businesses who haven't yet been forced out by Workspace's new plans for Faircharm. 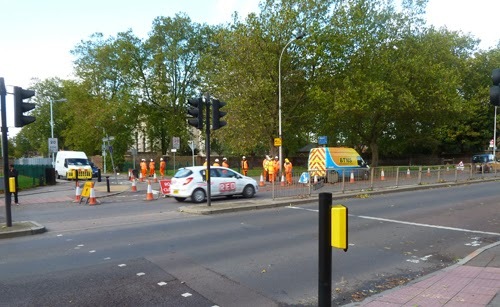 If the congestion caused by Thames Water’s work in Deptford Church Street has disturbed you over the last few days, it will give you a small glimpse of what’s to come once the Thames Tunnel works get underway. The chief difference is that instead of lasting three days, the Thames Tunnel work will last for three years! In order to build the Deptford spur of the so-called ‘super sewer’, Thames Water plan to sink a shaft on the green space between St Paul’s Church and St Joseph’s primary school. It will be some 46 meters deep and 17 meters in diameter. Spoil from the shaft and tunnelling work will be removed from site by hundreds of lorries, forcing the closure of the whole of the western carriageway of Deptford Church Street. No Crossfields resident needs reminding that this space is one of the few leafy open spaces in Deptford. It is close to St Joseph’s and Tidemill schools, the church, the High Street and us. Turning it into a construction site will deeply affect the community here, particularly our children. To add insult to injury the consultation process was deeply flawed. The Deptford site was only introduced halfway through the consultation phase, leaving little time for anyone to understand the impact. In spite of their boast that between 50-75% of the spoil and building materials will be carried by river, Thames Water opted for landlocked Deptford Church Street site over the original proposal which was for Borthwick Wharf on the riverfront. It’s a massive abandonment of their environmental principles, particularly as other infrastructure projects, such as Crossrail and the Olympic Park construction, have proven just how effective water-borne carriage can be. As if that wasn’t enough, Thames Water's own evaluation criteria in their Site Selection Methodology, specifies that areas close to schools, residential areas and historic buildings would not be used. • The Inspectorate has already decided that their inquiry will not discuss issues of principle or about any alternatives. This means that the case of the Tunnel itself cannot be challenged. However, the scope of the inquiry will include the specific design, sites, routes and operational processes proposed in the application. So the expectation is that we can argue against the selection of the site. 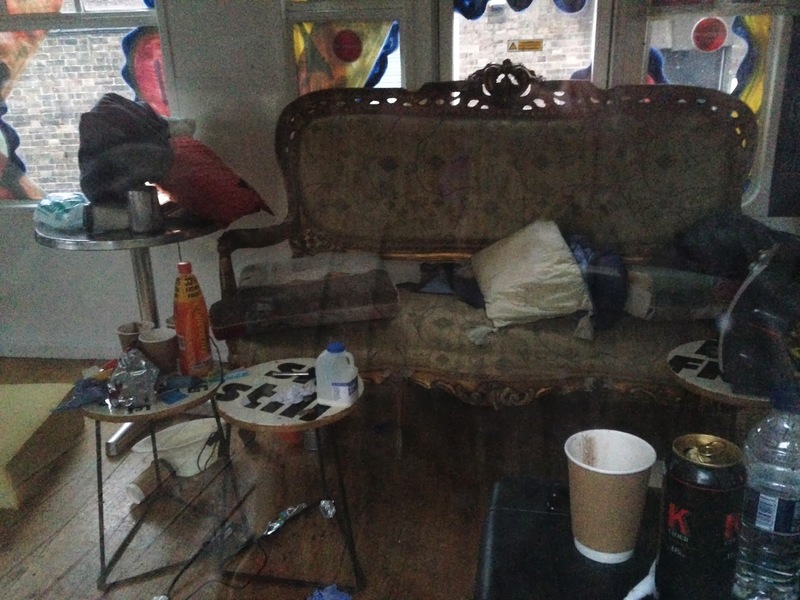 Efforts are now underway to revive the Don’t Dump on Deptford’s Heart Campaign, in order to demonstrate the extent of local opposition. A decision is expected in late summer/early autumn 2014.